Ares was the bullying god of war. He was the son of Zeus and Hera, but both parents disliked him. His name, “Ares,” means male warrior. Ares really was a male warrior, but not a good one. He sought pleasure upon observing destruction, war and human slaughter. When he heard the word “battle” he immediately put on his shiny helmet, polished his sharp blade and raced down to the mortals carrying with him Pain, Panic, Famine, and Oblivion. Although this god may seem high and mighty, he was a coward. It is said that whenever he was wounded, he would run to Mount Olympus where Zeus would cure him. Zeus was very ashamed of his son. He was unpopular between both mortals and immortals. The only humans who truly worshipped him were the savage people of Thracia, a region known for its fierce people. Ares was part of a populous family. As mentioned above, he was the only son of Zeus and Hera. One of his usual partners is Eris, his sister, the goddess of strife. Ares had one daughter and two sons. His daughter was Harmonia, and his sons were Eros (god of love) and Anteros (god of slighted love due to Ares’s affair with Aphrodite). His brother was Hephaestus who definitely did not like Ares because of his horrible secret affair with Hephaestus’s wife, Aphrodite. Aphrodite was a very beautiful goddess, and she was unhappily married to Hephaestus. The moment she laid eyed on Ares, she admired his good looks and decided to have a secret affair with him. Fortunately, he felt the same way. They became lovers and many stories were told about them. This love affair eventually came to an abrupt end one day. It was a sunny day and Aphrodite met up with Ares. They decided to fool around for some time, so meanwhile the nosey god of sun, Helios, spied on them. He instantly reported this situation to Hephaestus, who was obviously furious. He quietly went to see his wife with Ares, and suddenly he threw a net made of gossamer at them. This net trapped them in a very private embrace. Hephaestus laughed at the sight, but he was still not satisfied with his revenge. He invited all the Olympian gods and goddesses to come see the unfortunate pair. Most of the goddesses stayed at home, but all the male immortals saw the sight and laughed hysterically. 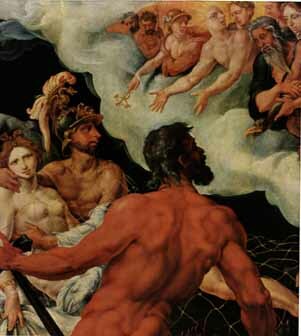 Some commented on Aphrodite’s beauty, and others spoke of how they would willingly exchange positions with Ares. 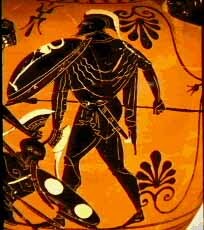 The symbol of Ares, the god of war, is the spear. He also has special animals dedicated to him. For example his bird is the vulture and his normal animal is the dog. The Roman god of war was Mars. Unlike Ares, the Romans (his people) looked him upon with great respect.